1. Department of Gastroenterology, Shanghai PuTuo District People's Hospital Affiliated to Tongji University, Tongji University School of Medicine, Shanghai, China. 2. Department of Geriatric Medicine, Shanghai PuTuo District People's Hospital Affiliated to Tongji University, Tongji University School of Medicine, Shanghai, China. 3. Department of Gastroenterology, The Shanghai Tenth People's Hospital of Tongji University, Shanghai, China. 4. Research Center of Allergy & Immunology, Shenzhen University School of Medicine, Shenzhen, China. 5. BGI Shenzhen, Shenzhen, China. Rationale: Immune dysfunction is thought to play an important role in the pathogenesis of inflammatory bowel disease (IBD), including ulcerative colitis (UC) and Crohn's disease (CD). However, the underlying mechanism requires further investigation. Vasoactive intestinal peptide (VIP) has immune regulatory functions, but its role in immune regulatory activities in the intestinal mucosa is not fully understood. This study aims to elucidate the role of VIP in the regulation of regulatory B cell (Breg) function in the intestine. Methods: Peripheral blood samples were collected from UC patients and healthy control (HC) subjects. Bregs were isolated from these samples and their immune regulatory function was analyzed. A murine colitis model was established to test the role of VIP in inhibiting inflammation in the intestine. Results: Serum IL-10 and VIP levels were lower in IgE+ (≥0.35 IU/mL) UC patients than that in HC subjects. The immune suppressive function of Bregs isolated from IgE+ UC patients was impaired. IL-10 mRNA decayed spontaneously in Bregs, which was reversed by VIP added to the culture. Tristetraprolin (TTP) bound IL-10 mRNA to speed its decay, which was blocked by VIP in the culture. Administration of VIP efficiently inhibited experimental colitis. Conclusions: Insufficient VIP levels in the microenvironment speeds IL-10 mRNA decay to cause Breg dysfunction. Administration of VIP can inhibit experimental colitis, suggesting the translational potential of VIP in the treatment of IgE+ UC. Inflammatory bowel disease (IBD) includes two subtypes: ulcerative colitis (UC) and Crohn's disease (CD). UC lesions are located within the colon while CD lesions can be found throughout the digestive tract . IBD pathogenesis is unclear, but it is thought that the aberrant immune responses to intestinal microbial products or/and food allergens are important causative factors of IBD. The pathological features of UC are mainly an aberrant T helper (Th) 2 response while Th1 responses are mainly observed in CD . Many therapeutic remedies have been used to treat IBD, but their therapeutic efficacy is not satisfactory and needs to be improved . Therefore, to better understand the pathogenesis of IBD, novel and more effective therapies for IBD are required. Under physiological conditions, the immune responses in the body are tightly regulated by the immune regulatory system. Regulatory T cells (Tregs) and regulatory B cells (Bregs) are the main cellular components in the immune regulatory system. By releasing immune regulatory mediators, such as transforming growth factor (TGF)-β and interleukin (IL)-10, Tregs or Bregs suppress the immune response of other immune cells that keep the immune responses within the proper range to avoid inducing tissue injury. In IBD, overproduction of proinflammatory cytokines (such as tumor necrosis factor (TNF)-α, interferon (IFN)-γ, and IL-17A) mirrors dysfunction of the immune regulatory system. Therefore, investigating the underlying mechanism in dysregulated immune responses in the intestinal mucosa will help us to better understand the pathogenesis of IBD. 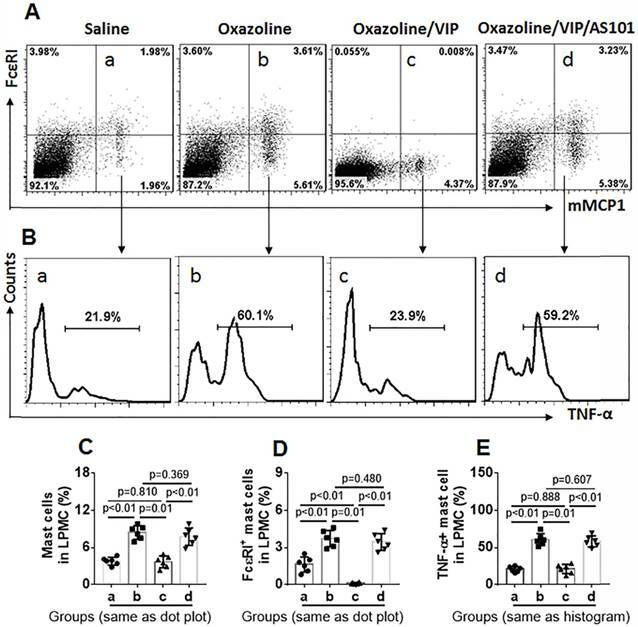 Vasoactive intestinal peptide (VIP) was shown to facilitate immune regulatory functions such as the VIP-induced increase in immune tolerance by recruiting Tregs . VIP administration also inhibits experimental colitis . VIP is produced by neurons, endothelial cells, epithelial cells, and immune cells from many tissues in the body. VIP has multiple functions, such as nervous communications, digestive functions, and immune regulation. Clinical findings indicate that serum VIP levels are lower in patients with immune disorders . Intestinal epithelial cells express VIP, which is decreased in UC patients . However, further investigation is required to determine whether the decrease in VIP is associated with intestinal inflammation. Bregs play an important role in maintaining immune homeostasis in the intestine , but the role of VIP in regulating Breg function is unclear. IL-10 is a critical mediator of Bregs. Upon exposure to proper stimuli, Bregs express IL-10. IL-10 regulation, such as mRNA splicing and stabilization, in Bregs requires further investigation. The mRNA life span in the cell is variable, ranging from several minutes to several days before it is degraded by binding to micro RNA or proteins; this phenomenon is called mRNA decay . 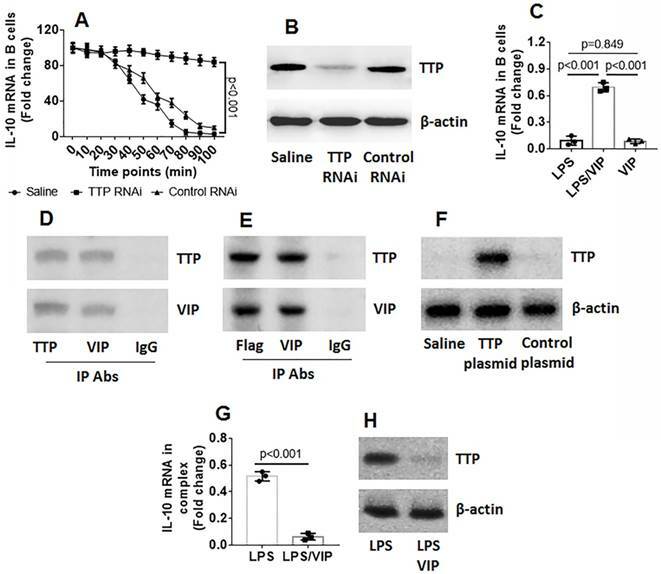 Additionally, tristetraprolin (TTP) can bind to mRNA to regulate its activity , and VIP can regulate IL-10 expression in murine lymphocytes . Therefore, we hypothesize that VIP can maintain IL-10 expression in Bregs. In this study, we detected a positive correlation between serum IL-10 levels and VIP in UC patients, and the immune suppressive function of Bregs isolated from UC patients was analyzed. The role of VIP in maintaining IL-10 expression in Bregs was investigated, and the inhibitory effects of VIP on colitis were observed in a murine model. Patients with both UC (at remission stage) and food allergy were recruited into this study at the Department of Gastroenterology, the Shanghai Tenth People's Hospital of Tongji University (Shanghai, China). The diagnosis and management of UC and food allergy were carried out by our physicians following established procedures [12, 13]. Based on serum IgE levels (assessed by ImmunoCap; Phadia, Uppsala, Sweden), UC patients were divided into IgE+ UC group (serum IgE ≥ 0.35 IU/ml) and IgE¯ UC group (serum IgE < 0.35 IU/ml). IgE+ UC patients had a positive skin prick test to one or more food allergens (Table 1) and positive serum specific IgE (≥ 0.35 IU/ml). None of IgE¯ UC patients and HC subjects had a positive skin prick test (Table 1) or positive food allergen specific IgE. A group of healthy control (HC) subjects was also recruited into this study. HC subjects did not have UC or food allergy history; serum IgE levels were less than 0.35 IU/ml and food allergen skin test negative. The demographic data are presented in Table 2. Subjects had any of the following conditions were excluded: Cancer; severe organ diseases; other autoimmune diseases; other allergic diseases; under treatment with immune suppressors. The using human tissue in the present study was approved by the Human Ethics Committee of Shanghai Tenth People's Hospital at Tongji University. An informed written consent was obtained from each human subject. Some patients were sensitized to more than one antigen. These foods are the most common food allergens in China. Following published procedures  with modification, CD19+ CD73- CD25+ CD71+ Bregs and CD4+ CD25¯ T cells were isolated from PBMCs or from the mouse spleen cells by flow cytometry sorting. CD4+ CD25¯ T cells were labeled with fluorescein isothiocyanate (CFSE) and cocultured with Bregs at a ratio of 5:1 in the presence of T cell activators [anti-CD3 antibody (5 µg/ml) and anti-CD28 antibody (2 µg/ml)]. Three days later, the cells were analyzed with a flow cytometer. Data are presented as mean ± SD. IgE+: Serum IgE levels ≥ 0.35 IU/ml. IgE¯: Serum IgE levels < 0.35 IU/ml. B cells were collected after relevant experiments. To cross link protein and RNA, the B cells were irradiate uncovered with 0.15 J/cm2 of 365 nm UV light in a Stratalinker 2400 (Stratagene) and lysed with a lysis buffer. The lysates were precleared by incubating with protein G agarose beads for 2 h. The beads were removed by centrifugation at 10,000 g for 10 min. The supernatant was collected and incubated with anti-TTP antibody or isotype IgG overnight. The immune complexes of TTP and the antibody were precipitated by incubating with protein G agarose beads for 2 h. The beads were collected by centrifugation. Immune complexes on the beads were eluted with an eluting buffer. RNA was extracted from the complex with TRIzol reagents and analyzed by RT-qPCR in the presence of IL-10 primer. Protein of the complex was analyzed by Western blotting. Following published procedures [15, 16], mice were topically applied with 3% oxazolone in 100% ethanol (150 μL) on the shaved abdominal skin to sensitize to oxazolone. Seven days after, the mice were administered intrarectally with 1.5% oxazolone in 50% ethanol (150 μL) in a polyethylene catheter. Control mice were treated with ethanol vehicle. Mice were sacrificed 3 days after rectal oxazolone administration. The difference between two groups was determined by Student t test. ANOVA followed by Dunnett's t test or SNK test was performed in multiple comparisons. P<0.05 was considered statistical significance. Reagent information and the procedures of collection of blood samples, isolation of PBMCs, cell culture, flow cytometry, RT-qPCR, Western blotting, IP, ChIP, testing TTP and VIP binding in HEK293 cells, RNAi, colon histology, isolation of LPMCs, measurement of MPO and colon epithelial barrier permeability are presented in supplemental materials. Blood samples were collected from IgE+ UC patients, IgE¯ UC patients, and healthy controls (HC). The serum from the samples was isolated and analyzed using ELISA. Compared with the HC group, Th2 cytokine (IL-4 and IL-13) levels were higher and Th1 cytokine (IFN-γ) levels were lower in the IgE+ UC group, while Th2 cytokine levels were lower and Th1 cytokine levels were higher in the IgE¯ group (Figure 1A-C). Serum TNF-α levels in both IgE+ UC groups were higher than that in the HC group, which were even higher in the IgE¯ UC group compared with the IgE+ UC group (Figure 1D). IL-10 and VIP levels were lower in the IgE+ UC group than that in the IgE¯ UC group and the HC group (Figure 1E-F). 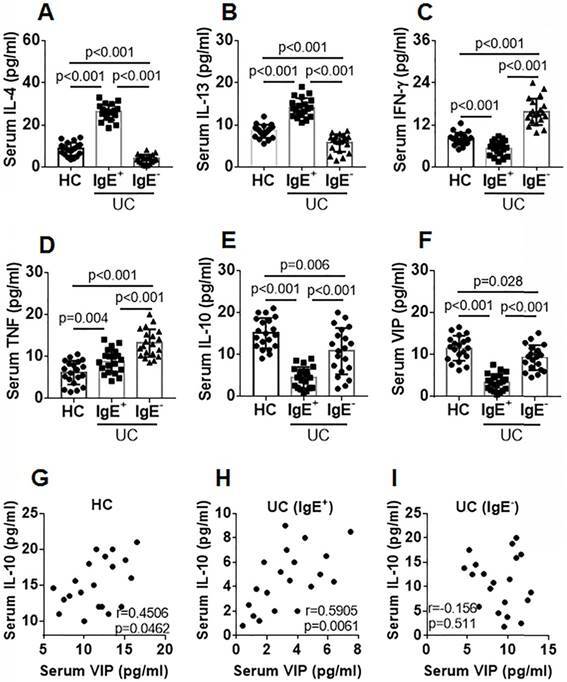 A positive correlation was detected between serum IL-10 and VIP levels in the IgE+ UC group and in the HC group, but not in the IgE¯ UC group (Figure 1G-I). No correlation was detected between serum VIP levels and IL-4, IL-13, IFN-γ, or TNF-α levels (not shown). Bregs are an important part of immune regulatory cells, and IL-10 is the immune regulatory molecule for Bregs . Thus, we assessed the frequency of Bregs in PBMCs of UC patients and HC subjects. The results showed that the frequency of Bregs between the UC group and the HC group was comparable (Figure 2A-D). We then isolated Bregs from PBMCs. CD4+ CD25¯ T cells were isolated from the HC group and labeled with CFSE. The Bregs and CD4+ CD25¯ T cells were cocultured in the presence of cell activators (PMA/ionomycin for Teffs and CD40L for Bregs) for 3 days. 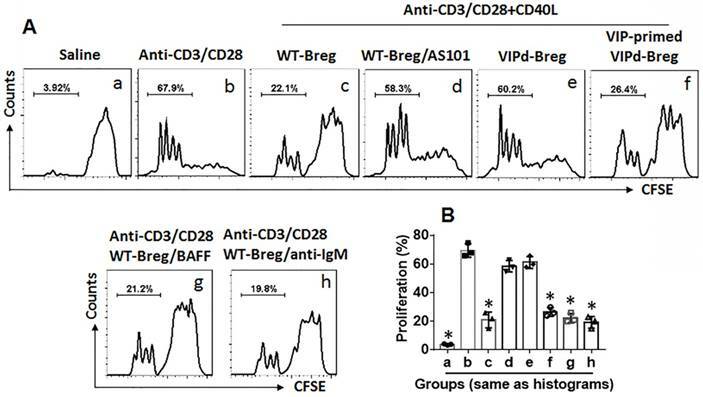 As analyzed by flow cytometry, exposure to activators markedly increased CD4+ CD25¯ T cell proliferation, which was suppressed by the presence of HC Bregs (Bregs isolated from HC subjects), but not UC Bregs (Fig 2E-F). The Bregs were further analyzed using RT-qPCR and Western blotting. The results showed that IL-10 expression was significantly lower in UC Bregs compared to HC Bregs (Figure 2G-H). IL-10 expression in Bregs was also positively correlated with serum VIP levels (Fig 2I-J). The results indicate that the immune suppressive function of UC Bregs is impaired, which is probably associated with lower serum VIP levels and the lower IL-10 expression in Bregs. To examine the role of VIP in maintaining Breg immune suppressive function, Bregs were isolated from the spleen of VIP-deficient (VIPd) mice and wild type (WT) mice. CD4+ CD25¯ T cells were isolated from the WT mouse spleen and labeled using CFSE. Bregs and CD4+ CD25¯ T cells were cocultured at a ratio of 1:5 in the presence of T cell activators (anti-CD3/CD28 Abs) and B cell activators (CD40L, or BAFF, or anti-IgM Ab) for 3 days. The cells were analyzed by flow cytometry. As shown in Figure 3, WT Bregs showed competent immune suppressive effects on CD4+ CD25¯ T cell proliferation, which were blocked by the presence of an IL-10 inhibitor, AS101, in the culture. Bregs from VIPd mice showed incompetent immune suppressive effects on CD4+ CD25¯ T cell proliferation compared to WT Bregs. Additionally, VIPd-Bregs were exposed to VIP in culture for 2 days, and Bregs showed efficient suppressive effects on CD4+ CD25¯ T cell proliferation. The results suggest that VIP is required to maintain Breg immune suppressive function. Serum IL-10 levels are positively correlated with serum VIP levels. Blood samples were collected from IgE+ UC patients (n=20), IgE¯ UC patients (n=20) and HC subjects (n=20). The sera were isolated from the samples and analyzed by ELISA. A-F, bars indicate serum levels of IL-4 (A), IL-13 (B), IFN-γ (C), TNF (D), IL-10 (E) and VIP (F). G-I, scatter dot plots show correlation between serum levels of VIP and IL-10 in the HC group (G) or the IgE+ group (H) or the IgE¯ group (I). Data of bars are presented as mean ± SEM. Each dot inside bars presents data from an independent experiment. Statistical methods: ANOVA + SNK for bar graphs; Pearson correlation assay for correlation assay. Assessment of peripheral Breg number and function. Blood samples were collected from HC subjects (n=20) and UC patients (n=20). A-D, PBMCs were isolated from the samples and analyzed by flow cytometry. A, gated dot plots show frequency of CD73¯ CD19+ B cells. B, bars indicate summarized B cell frequency of panel A. C, gated dot plots show frequency of Bregs in PBMCs. D, bars indicate summarized frequency of Bregs. E, Bregs and CD4+ CD25¯ T cells (labeled with CFSE) were cocultured at a ratio of 1:5 with the conditions denoted above each subpanel for 3 days (CD40L was added to the culture to activate Bregs at 50 ng/ml). Flow cytometry dot plots show frequency of proliferating Teffs. F, bars indicate summarized frequency of proliferating Teffs. G-H, expression of IL-10 in Bregs. I-J, correlation between serum VIP levels and IL-10 mRNA in peripheral Bregs. Data of bars are presented as mean ± SEM. Each dot inside bars presents data of an independent experiment. Statistical methods: t test for B and D; ANOVA followed by Dunnett t test for F; Pearson correlation assay for correlation assay. Bregs were isolated from mouse spleen and cultured in RPMI1640 medium. The Bregs were collected at 48 h, and RNA and proteins were extracted from the Bregs, followed by analysis of IL-10 expression using RT-qPCR and Western blotting. The results showed that IL-10 expression in the Bregs decayed spontaneously (Figure 4A-B). Cell viability was greater than 99%, indicating that the IL-10 mRNA decay was not because of a decrease in cell number. Because VIP can regulate B cell activity, we inferred that VIP might regulate IL-10 expression in Bregs. To test this hypothesis, VIP was added to the Breg culture medium. IL-10 expression decay was prevented by the presence of VIP in a dose-dependent manner (Figure 4C-D). The results suggest that VIP is required to maintain IL-10 expression in Bregs. To verify these results, mice were treated with anti-VIP antibody daily for 1 week. Bregs were isolated from the spleen and gut on day 7, RNA was extracted from the Bregs, and IL-10 expression was assessed using RT-qPCR. The results showed that the treatment with anti-VIP attenuated IL-10 expression in Bregs (Figure 4E-F). The data were further confirmed because Bregs from the VIPd mouse spleen and gut also showed lower IL-10 expression (Figure 4G-H). The results demonstrate that VIP is required to maintain IL-10 levels in Bregs. VIP is required in maintenance of Breg immune suppressor function. CD4+ CD25¯ T cells were isolated from 6 naive mouse spleen and labeled with CFSE. Bregs were isolated from spleen of VIP-deficient (VIPd) mice or wild type (WT) mice. Teffs and Bregs were cocultured at a ratio of 5:1 in the presence of the indicated conditions (denoted above each subpanel) for 3 days. The cells were analyzed by flow cytometry. A, the gated histograms show proliferating CD4+ T cells. B, the bars show summarized data of CD4+ T cell proliferation. Data of bars are presented as mean ± SEM. Each dot presents data from one independent experiment. *p<0.001, compared with group b (ANOVA + Dunnett t test). VIP-primed VIPd Breg: VIPd Bregs were exposed to VIP (10 pg/ml) in the culture for 48 h before coculture with Teffs. CD40L: 50 ng/ml. BAFF: 200 ng/ml. Anti-IgM: 5 µg/ml. The data represent 3 independent experiments. VIP maintains IL-10 expression in Bregs. A-B, spleens cells were prepared from naive mice, pooled and cultured at 2×106 cells/ml. The cells were harvested at indicated time points and analyzed by RT-qPCR. The bars indicate IL-10 mRNA levels and the immunoblots indicate IL-10 protein in Bregs. C-D, Bregs were isolated from naive mouse spleen cells and cultured in the presence of VIP (the dosage of VIP is denoted on the x axis) for 48 h. The bars indicate IL-10 mRNA levels and the immunoblots indicate IL-10 protein in Bregs. E-F, naive mice (6 mice per group) were treated with anti-VIP Abs (αVIP) or isotype IgG (cAb or control Ab) daily for 7 days. Bregs were isolated from spleen and gut. The bars indicate IL-10 mRNA levels and the immunoblots indicate IL-10 protein in Bregs. G-H, Bregs were isolated from spleen and gut of VIP-deficient mice or wild type (WT) mice. The bars indicate IL-10 mRNA levels and the immunoblots indicate IL-10 protein in Bregs. Data of bars are presented as mean ± SEM. Each dot presents data from one independent experiment. Data of A and C represent 3 independent experiments. Data E and G represent 6 independent experiments. Protein extracts of each group were pooled, respectively. Data of B, D, F and H are from one experiment representing 3 independent experiments. Each sample was tested in triplicate. Statistical methods: t test for A; ANOVA + Dunnett t test for C, E, G.
Data reported in Figures 1-4 suggest that VIP may be involved in regulating IL-10 expression in Bregs. To test this hypothesis, naive B cells were isolated from mouse spleen and exposed to VIP in culture for 3 days at several concentrations. However, the results showed that exposure to VIP did not alter IL-10 gene transcription activities in B cells (Figure S1 in Supplemental Materials). The data indicate that VIP is not involved in IL-10 gene transcription in B cells. Because TTP mediates RNA decay , we wondered if VIP could inhibit TTP to prevent TTP from binding IL-10 mRNA to induce IL-10 mRNA degradation. To this end, we stimulated B cells with LPS for 2 h. The B cells were washed and cultured in fresh medium. We collected the B cells at 0, 24, 36, 48, 72, and 96 min, respectively. IL-10 expression in the B cells were analyzed by RT-qPCR. The results showed that the IL-10 mRNA levels were gradually decreased in B cells in a time-dependent manner (Figure 5A). To determine if the presence of TTP is involved in decreasing IL-10 levels in B cells, TTP-deficient B cells (Figure 5B) were treated with LPS in the culture, and IL-10 mRNA decay in B cells was found to be abolished (Figure 5A). The results confirm that TTP is the factor that causes IL-10 mRNA decay and suggests that VIP may inhibit TTP activity to prevent IL-10 mRNA decay. To test this hypothesis, both LPS and VIP were added to B cell culture for 48 h. The results showed that VIP successfully abolished the TTP-induced IL-10 mRNA decay in B cells (Figure 5C). Data from co-immunoprecipitation showed that VIP bound TTP to forms a complex in B cells (Figure 5D), and this phenomenon was reproduced by the VIP-bound recombinant TTP in HEK293 cells (Figure 5E-F). Additionally, a complex of TTP and IL-10 mRNA in B cells after exposure to LPS was abolished by the presence of VIP (Figure 5G-H). Together, the results demonstrate that TTP binds IL-10 mRNA to cause IL-10 mRNA decay, which can be antagonized by VIP. VIP antagonizes TTP-induced IL-10 mRNA decay in B cells. B cells were isolated from mouse spleen by MACS. A, wild type (WT) B cells and TTP-deficient B cells were exposed to LPS for 2 h, washed with fresh medium, and then cultured in fresh medium. The B cells were collected at indicated time points (denoted on the x axis) and analyzed by RT-qPCR. The curves show IL-10 mRNA levels in B cells. B, results of TTP RNAi. C, B cells were exposed to LPS or/and VIP in the culture for 36 h. Bars indicate IL-10 mRNA levels in B cells. D, immunoblots indicate a complex of TTP and VIP in B cells after exposure to LPS and VIP in the culture for 36 h. E, immunoblots indicate a complex of TTP and VIP in HEK293 cells. F, TTP over expression results. G-H, a complex of TTP and IL-10 mRNA in B cells after exposure to LPS or LPS and VIP in the culture for 36 h. Data of bars are presented as mean ± SEM. The dot inside bars present data from an independent experiment. Data of A, C and G represent 3 independent experiments. The immunoblots are from one experiment that represent 3 independent experiments. Statistical methods: ANOVA + Dunnett t test for A; ANOVA + SNK for C; t test for G.
Next, we tested the role of VIP in the inhibition of colitis. Throughout colitis induction, VIP was administered to mice daily for 1 week. 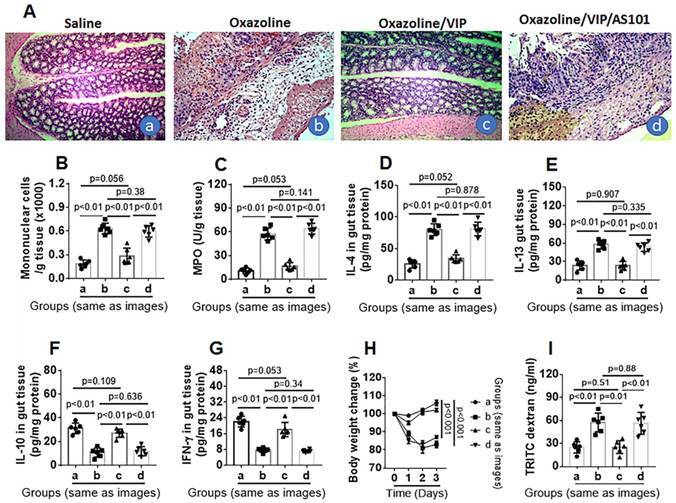 The results showed that mice treated with oxazolone had colitis-like inflammation in the colon, including destruction of colon tissue (Figure 6A), profound infiltration of mononuclear cells in the colon (Figure 6A-B), increased MPO, IL-4, and IL-5 levels (Figure 6C-E), decreased IL-10 and IFN-γ levels (Figure 6F-G) in protein extracts of colon tissue, decreased body weight (Figure 6H), and impaired intestinal epithelial barrier function (Figure 6I), which was abrogated by VIP administration (Figure 6). The results suggest that the presence of VIP inhibits colitis induction, presumably through maintaining IL-10 expression in Bregs in the colon (Figure S2-4). To verify the results, a group of mice was treated with oxazolone, VIP, and IL-10 inhibitor. Blocking IL-10 abolished the inhibitory effects of VIP on colon mucosal inflammation (Figure 6). Further, LPMCs were isolated from the colon of the mice and analyzed by flow cytometry. As shown by Figure 7, the frequency of mast cells in UC mice was significantly higher than that in control mice. The results suggest that mast cells play a role in inducing inflammation in the colon. The frequency of mast cells in LPMCs in the colon was reduced in UC mice treated with VIP. We also found that FcɛRI expression was markedly less in mast cells in mice treated with VIP than those were not treated with VIP. The results demonstrate that VIP suppresses FcɛRI expression in mast cells in the colon mucosa. This suppressive effect was abolished by the presence of IL-10 inhibitor, indicating that VIP suppresses FcɛRI in mast cells via IL-10, which is consistent with previous studies . To reproduce this phenomenon in in vitro experiments, we generated bone marrow-derived mast cells (BMMCs). Over 98% of BMMCs expressed mMCP1 and FcɛRI, as assessed by flow cytometry (Figure 8A). BMMCs were exposed to VIP in the culture for 48 h, and we found that exposure to VIP inhibited FcɛRI expression in BMMCs in a concentration-dependent manner (Figure 8B). These results demonstrate that VIP suppresses FcεRI expression in mast cells. In this study, we found that Bregs' immune suppressive function in UC patients was impaired because of lower IL-10 expression, although the frequency of peripheral Bregs was not decreased. The serum IL-10 and VIP levels were lower in IgE+ UC patients than in HC subjects. A positive correlation was identified between IL-10 and VIP in the serum of IgE+ UC patients and HC subjects, but not in IgE¯ UC patients. IL-10 expression in B cells decreased spontaneously, and this decrease could be stabilized in the presence of VIP. VIP formed a complex with TTP, and this physical contact prevented TTP from decreasing IL-10 mRNA in B cells. VIP antagonized Th2 response-related colitis in mice. VIP inhibits experimental colitis. Mice (6 mice per group) were treated with oxazolone to establish colitis. The treatment is denoted above each histology image. A, representative images show colon histology. B, bars indicate mononuclear cells in the colon tissue (counted by flow cytometry). C-G, bars indicate levels of MPO (C), IL-4 (D), IL-13 (E), IL-10 (F) and IFN-γ (G) in protein extracts of colon tissue. H, curves indicate mouse body changes after treating with oxazolone. I, bars indicate serum levels of TRITC signal in serosal sides of Ussing chambers. Original image magnification: ×100. VIP: Mice were treated with VIP (15 μg in 0.2 ml of PBS) intraperitoneally daily for 1 week. AS101: 10 µg/mouse; ip on day 0, day 3 and day 6, respectively. Data of bars are presented as mean ± SEM. Each dot inside bars present data from an independent experiment. Statistical methods: t test for B-G and I; ANOVA + Dunnett t test for H.
VIP suppresses FcɛRI expression on mast cells in the UC mouse colon. LPMCs were prepared with the colon collected from UC mice and control mice as described in Figure 6. The LPMCs were analyzed by flow cytometry. A, dot plots show the frequency of mast cells and FcɛRI+ mast cells. B, gated histograms show the frequency of TNF-α+ mast cells. C, summarized data of mast cells in LPMCs. D, summarized data of FcɛRI+ mast cells in LPMCs. E, summarized data of TNF-α+ mast cells in LPMCs. Data of bars are presented as mean ± SEM. Each dot inside bars present data from an independent experiment. Statistical methods: ANOVA + Dunnett t test. VIP suppresses FcɛRI expression in BMMCs. BMMCs were generated from the bone marrows of BALB/c mice. A, flow cytometry data show more than 98% BMMCs express FcεRI and mMCP1. B-C, BMMCs were exposed to VIP at indicated concentrations (denoted on the x axis) in the culture for 48 h. Bars indicate FcεRI mRNA levels in BMMCs. Immunoblots indicate FcεRI protein levels in BMMCs. Data of bars in panel B are presented as mean ± SEM. Each dot inside bars present data from an independent experiment. The data of A and C represent 3 independent experiments. *p<0.001, compared with group “0” (ANOVA + Dunnett t test). The present data show that IgE+ UC patients have a skewed Th2 response while IgE¯ UC patients have a skewed Th1 response in the peripheral system. 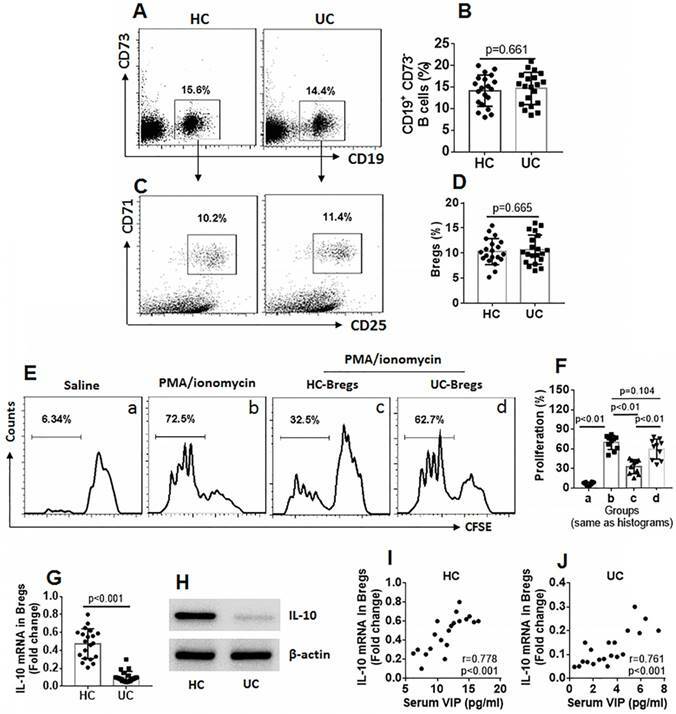 It is generally accepted that UC belongs to the Th2 pattern of inflammation  while reports also show that the Th1 response plays a role in the pathogenesis of UC. For example, Masuda et al. reported that IL-8, TNF, and IFN-γ expression was increased in UC patients at the inactive stage, and the authors suggested that these three cytokines play an important role in UC pathogenesis . A skewed Th1 response was also reported in an experimental colitis mouse model induced by dextran sodium sulfate (DSS) . Our previous observations show that UC patients with a food allergy had a Th2 response in the peripheral system, and the clinical symptoms of UC can be ameliorated by food allergen-specific immunotherapy , suggesting that food allergen-related immune response plays an important role in UC pathogenesis. Our animal experimental studies also show that sensitization to food allergens can induce colitis-like inflammation in the mouse colon mucosa . IgE is the major mediator in allergic responses, and by binding the high affinity IgE receptors on the surface of mast cells, IgE sensitizes mast cells. Re-exposure to specific antigens can evoke degranulation in sensitized mast cells, and proinflammatory mediators, such as histamine and TNF-α, are released into tissue to induce inflammation. Thus, IgE can be an important factor contributing to the pathogenesis of UC. Our data support this statement by showing that specific IgE was detected in the serum of a portion of UC patients. Our data demonstrate that both skewed Th1 and Th2 responses can be detected in UC patients, and such a phenomenon implies that both skewed Th1 and Th2 responses can contribute to UC pathogenesis. The present data propose that serum IgE levels can indicate differentiation in the pattern of immune responses in UC patients. We found that although the frequency of peripheral Bregs in UC patients was comparable with that in HC subjects, the immune suppressive function of Bregs was impaired in UC patients. The data suggest that the inflammatory environment of UC does not affect Breg lineage development, but it impairs Breg immune regulatory capacity in UC patients. Lower IL-10 expression was detected in UC Bregs. Bregs are an important fraction of the immune regulatory system . Through uptake of apoptotic cells, Bregs produce IL-10 to fulfill immune regulatory functions such as restricting inflammation in the intestine . Several Breg subtypes have been reported, in which IL-10 is the most important immune suppressive mediator . In this study, we observed the CD19+ CD25+ CD73¯ CD71+ Breg subtype in the human peripheral blood system and mouse spleen. Using whole-genome expression analysis, flow cytometry, and suppression assay, van de Veen et al. found that this fraction of Bregs produces high IL-10 levels in healthy subjects . Our data are consistent with van de Veen's results because we showed that Bregs from HC subjects express IL-10, while the Bregs from UC patients express much lower levels of IL-10, which can be up regulated by VIP. We observed that, even when obtained from HC subjects, IL-10 expression in Bregs spontaneously decreased gradually in in vitro culture; this phenomenon is called mRNA decay . To our knowledge, this is the first report describing IL-10 mRNA decay in Bregs. The data show that the IL-10 mRNA decay can be antagonized by the presence of VIP in the culture. VIP is produced by many cells, such as neurons, endocrine cells and immune cells. Thus, VIP can be absorbed into the bloodstream to regulate various bioactivities . Our data show that the presence of VIP in culture blocks IL-10 mRNA decay in Bregs, indicating that VIP is an important molecule to stabilize IL-10 expression in Bregs. Lower serum VIP levels in UC patients suggests that VIP in serum is insufficient to stabilize IL-10 expression in Bregs. We also observed TTP expression in B cells. TTP is one of the proteins that regulates mRNA activity . The data show B cell status, and the higher the TTP levels, the lower are IL-10 mRNA levels in B cells. Knockdown of TTP abolished the spontaneous IL-10 mRNA decay in B cells. Ebner et al. reported that TTP bound to myeloid cell leukemia 1 (Mcl1; an anti-apoptotic protein) to speed up Mcl1 decay and inhibit neutrophil apoptosis . Our data are consistent with the previous studies because we showed that TTP formed a complex with IL-10 mRNA in B cells after exposure to LPS in culture. The data suggest that inhibition of TTP abolishes the TTP-induced IL-10 mRNA decay that may contribute to the maintenance of immune tolerance because IL-10 is an important immune regulatory molecule . The data show that serum VIP levels are lower in UC patients than that in HC subjects. Published data show that VIP is associated with the regulation of intestinal inflammation [7, 30]. Immunohistochemistry studies show that distribution of VIP-positive nerves in IBD patients is significantly less than that in normal intestinal tissue , while Jonsson et al. found that intestinal epithelial cells expressed VIP was decreased in UC patients . However, researchers also observed increases in serum VIP levels  or increases in VIP expression in the intestine  in IBD patients. Our data provide mechanistic evidence to explain the opposite research data on VIP in IBD, which showed that serum VIP levels are lower in IgE+ UC patients than that in IgE¯ UC patients. Clinical aspects show that IgE+ UC patients also have a food allergy history, higher serum IgE levels, and are food-allergen SPT positive, indicating that the serum lower VIP levels are associated with the allergic environment. This finding needs to be further investigated. In this study, the data show that VIP administration efficiently inhibited experimental colitis as well as restored IL-10 expression in Bregs in the colon mucosa. The results showed that administration of VIP restored the tissue structure in the colon and regulated the cytokine levels close to normal control levels. Such immune regulatory effects are attributed to the role of IL-10 in Bregs. This is consistent with published data. Matsumoto et al. found that Bregs inhibit Th1 and Th17 cell development by suppressing pro-inflammatory cytokine production in dendritic cells . Mizoguchi et al. indicate that, through producing IL-10, Bregs suppresses the progression of intestinal inflammation by downregulating inflammatory cascades . van de Veen et al. observed that Bregs suppressed allergen-specific T cell responses . Together, the present data demonstrate that VIP administration can restore Breg function, suppress proinflammatory cytokine overproduction, inhibit the allergen-specific T cell response, and restore colon tissue structure in experimental colitis. The data suggest that VIP has the translational potential to treat patients with UC who have aberrant immune responses to food allergens. The data show that, following VIP administration, FcɛRI expression in mast cells was markedly decreased in Bregs in the colon. Exposure to VIP in the culture also suppressed FcɛRI expression in BMMCs. FcɛRI is a critical molecule to mediate the stimulus of specific antigen/IgE on activating mast cells in allergic responses. Mast cells are one of the major effector inflammatory cells in colon inflammation  and one of the major sources of TNF-α in the body . TNF-α is a canonical proinflammatory cytokine in IBD. Inhibiting TNF-α can efficiently ameliorate IBD symptoms . Therefore, based on a literature review and the present data, we may envision a scenario where administration of VIP suppresses FcεRI expression in mast cells, while less specific IgE can bind to the surface of the mast cells. Therefore, mast cells may not be able to respond to specific antigens (such as food antigens), to release chemical mediators, such as TNF-α, or to evoke the inflammatory response. In summary, the present study reveals that serum IL-10 and VIP levels are decreased in IgE+ UC patients. VIP plays an important role in stabilizing IL-10 mRNA in Bregs, and it efficiently inhibits experimental colitis in mice. Therefore, our data suggest that VIP can be a therapeutic candidate in the treatment of IgE+ UC with aberrant immune responses to food allergens. IBD: Inflammatory bowel disease; UC: ulcerative colitis; CD: Crohn's disease; Breg: regulatory B cell; HC: healthy control; TTP: tristetraprolin; IL: interleukin; TGF: transforming growth factor; Tregs: regulatory T cells; VIP: vasoactive intestinal peptide; LPMC: lamina propria mononuclear cells; CFSE: carboxyfluorescein diacetate succinimidyl ester. This study was supported by grants from the National Nature and Science Foundation of China (81870706, 31570932, 81700888, 81701589, 81670606), the Shenzhen science, technology and innovation committee (CXZZ20140902151802864, JCYJ20170307162827158, KQTD20170331145453160) and Guangdong Nature Science Foundation (2015A030313786). XS, CG, FZ, JZ, YX, ZQL, GY, YYZ and XG performed experiments, analyzed data and reviewed the manuscript. ZL and PCY designed the project, supervised experiments and prepared the manuscript. Corresponding authors: Dr. Zhanju Liu. Department of Gastroenterology, The Shanghai Tenth People's Hospital of Tongji University. Shanghai, China. Email: liuzhanju88com. Tel: 862166300588. Fax: 862166300589. Dr. Ping-Chang Yang. Room A7-509 at Xili Campus. 1066 Xueyuan Blvd. Shenzhen University School of Medicine. Shenzhen 518055, China. Email: pcy2356edu.cn. Tel: 8675586172722. Fax: 8675586671906.